The synagogue was established by the local Jews in 1939. 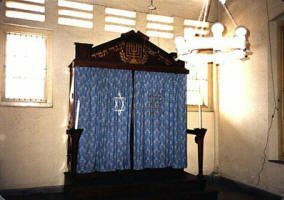 It is the only synagogue in use today in Indonesia. The one-storey rectangular building has a wooden entrance door on the west-side, a wooden Bimah decorated with stars of David on the east-side and in front of it, a wooden carved Ark. Regular windows are fixed in the outer walls of the building. The whole synagogue structure is very small and modest. It is maintained by a few Jewish families.